Colorescience® stands for a better kind of beauty, bringing together skin protection, nourishment and superior color and texture together in every single product. We promise you a better kind of beautiful because our all-in-one cosmetics and suncare products are a better kind of formulation. We’re on a mission to create flawless makeup that doesn’t make you compromise health for lasting beauty. 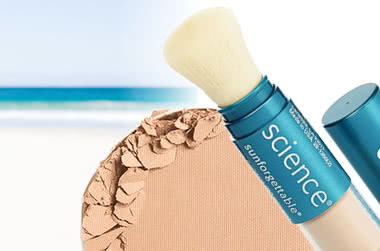 Colorescience® ensures your skin can look gorgeous today, tomorrow and beyond. Why? Colorescience® knows life happens. The sun happens. But Colorescience® is here for you! The beauty brand that has makeup with sun protection and skincare built-in figured out. This brush is super soft and feels so nice on my face. The bristles are even and fairly dense, which makes it easier to get a nice application of powder foundation on my skin. I use this alone as my tinted coverage for the day, but have also used it as a primer (also excellent). It’s light, blends easily, gives you a glow without any greasy shine and really does even out skin tone beautifully. This bottle lasts me 9 months or so with daily use.